Dakar — About two-thirds of patients in Congo's latest Ebola outbreak have been women, the World Health Organization said on Thursday, calling for more focus on gender in disease control and prevention. The outbreak in eastern Democratic Republic of Congo is the world's second largest and has infected 663 people so far, killing 407, according to health ministry data. In past Ebola outbreaks, including the largest which killed 11,300 people in West Africa in 2014-2016, the proportion of women and men affected was roughly equal, WHO experts said. This is the 10th outbreak recorded in Congo. "This is unexpected," said Matshidiso Moeti, WHO regional director for Africa, calling for more research. "It shows the role of women needs to be taken into account right from the get-go," she told the Thomson Reuters Foundation. Congo is a vast country where social roles vary significantly by region. In the North Kivu province fighting Ebola, women are leaders and often heads of households, said Julienne Anoko, a social anthropologist working for WHO. They are the ones who care for the sick, take them to the hospital if needed, and prepare bodies for burial, all of which expose them to greater risk of infection, she said. Girls often help their mothers with these tasks, and have also been infected at higher rates than boys, she added. Ebola spreads through contact with bodily fluids and causes haemorrhagic fever with severe vomiting, diarrhoea and bleeding. "Women have lots of social power. They take care of the whole community," Anoko told the Thomson Reuters Foundation. This contrasts with other countries that have battled Ebola, such as Guinea and Sierra Leone, where it is more common for men to accompany family members to hospital, she said. The part of Congo where Ebola has struck this time is an active conflict zone, where health workers have had to dodge bullets and been confronted by armed groups. A disputed election has stoked further fear and unrest. Many women have been mistrustful of male responders, but WHO has started to see success in spreading messages about the disease through local female leaders, said Anoko. "We need to increase the involvement of women," she said. 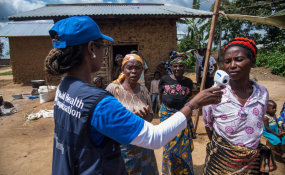 WHO Africa director Moeti, the first woman to hold that position, said gender should play a bigger role in data analysis for outbreaks of all infectious diseases. "I think we really need to take this into account as a core part of our work on outbreak responses," she said.